This is a more relaxed version of pose#2. Here she is casually sitting on the barstool at her white marble bar top that she purchased from the Kress building renovation. She loved hats and jewelry so I have added some of her more iconic pieces in this sketch. In this drawing I have added the suggestion of the plinth as well as the checkerboard lilypad. This is a lot of extra weight and cost in bronze by adding the pad at the base but as a design element it is something that I’ll be exploring in the maquette to see how much it actually adds to the overall sculpture as well as having a dialog with the foundries and the patina specialist. 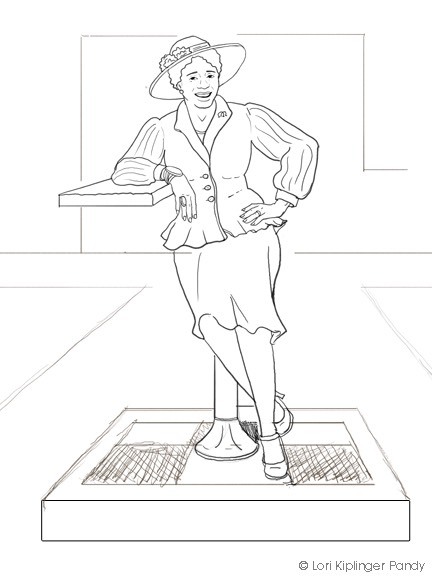 Originally I liked the standing pose #2 as I feel that Fannie Mae was seldom sitting and constantly on the move, working. 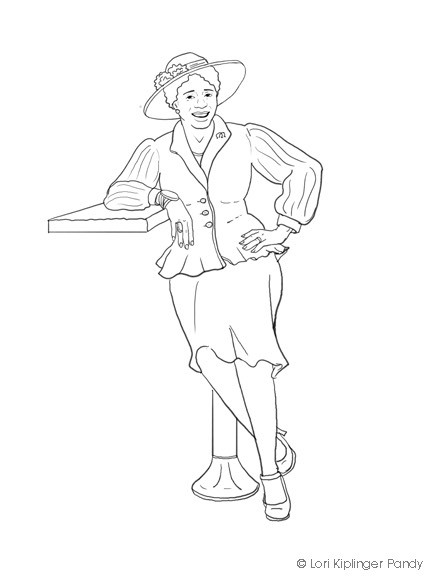 However….given that the theme is “Everybody Welcome” this pose does feel a bit more relaxing and welcoming - as if you could sit down and chat with Fannie Mae right there at the counter.